Before having my son, I didn’t give much thought to what kind of parent I wanted to be. However, there was one thing I knew for certain. I was going to be Strict. Nine years of being a secondary school teacher, and observing countless children-and therefore the long-term consequences of the actions of countless parents-and I knew Strict was best. I once asked the parent of a particularly pleasant child how she had managed to raise such a wonderful daughter, and although she didn’t actually say the answer was Being Strict, I was sure that was what was behind her success. Fast forward almost two years into my own parenting journey, and I am not so sure. Not only am I not particularly inclined to start setting boundaries for a baby, but when said baby does do something that probably shouldn’t be encouraged, I find it hard not to laugh. Especially when he is laughing too. This is yet another source of disagreement between my mother and I. Mother believes that the reason that meals with Piglet frequently result in dropped food is because he is undisciplined and, with yours truly for a mother, has become accustomed to running riot. Conversely, I believe it is because he is a toddler, and such is their wont. However, recently there have been some worrying developments (clearly the fault of my louche parenting style), including throwing things at people, as opposed to merely throwing things around indiscriminately without any particular aim. Today, it was a piece of banana. Tomorrow, who knows? A toy car? The kitchen crockery? A molotov cocktail? I enjoy my civilised* meals out with Piglet. I enjoy the one-to-one mother and son bonding time, and the intellectual conversation and debate (the latter is something I’m still working on, but I have managed to get him to say two more words “adder” as in the variety of snake, and “Adele,” as in chart-topping songstress Adele. The fact that both of these sound exactly like his default sound “A-da” is neither here nor there). I also enjoy the indulgent looks of the other diners as they gaze at Piglet adoringly, enquire about his age and give knowing looks when he does something cute that they recognise from when their own children were small. I don’t think they will be looking indulgently for much longer if Piglet persists in throwing pieces of food around. And this time, it’s personal. The food in question is not merely being thrown to the floor, it is being aimed squarely at other people. For the moment, Mummy (with an occasional side order of “Granny”) seems to be the main target, but who knows where this could lead? He has started to literally pull his arm back and take aim. 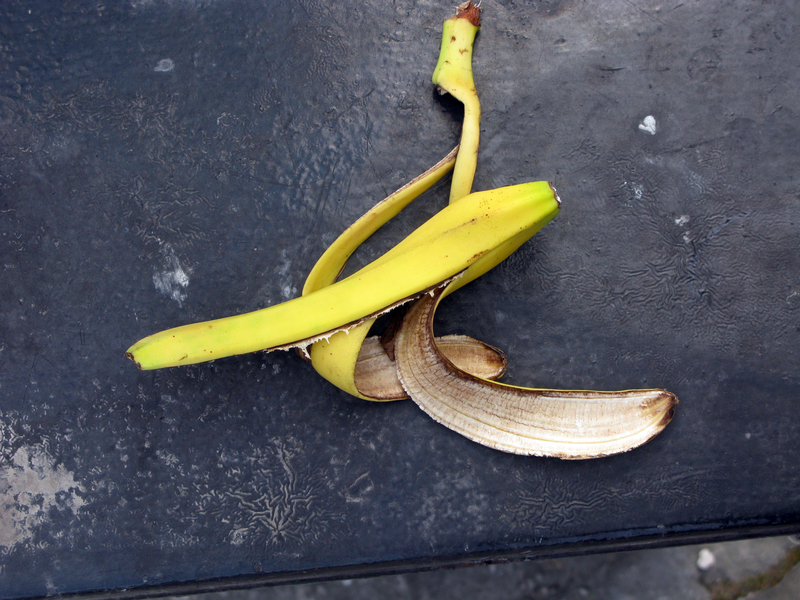 Today the missile was a bit of half chewed banana, which I suddenly found being launched at me as if from a catapult. The banana bounced off my face, and landed underneath another child’s high chair (always good to be able to pin the blame on somebody else). Piglet then burst into peals of laughter. Watching Mummy humiliated is always a good sport for a child. Try not to trip on this one, fellow diners. The trouble is, I wanted to laugh. Like I wanted to laugh the time a group of Year 11 boys smuggled one of their friends from another school into the classroom and tried to pass him off as a Dutch exchange student with a dodgy accent; and like that was probably bad teaching, laughing at the flying banana was probably bad parenting. So what to do? Do I hotfoot it to the library in search of the Gina Ford Book of Really Strict Parenting? Or do I keep muddling along, hoping that a combination of love, laughter and civilised mother and son intellectual conversation will see us through? In a few years time, I want it to be me that my child’s teacher is asking for tips on How To Raise The Perfectly Behaved, Well Adjusted and Motivated for Learning Child. I don’t want to be the one being called in for countless meetings at the school, and being told that it would probably be for the best if I quietly withdrew him from full time education. Home schooling is all the rage these days, you know. Perhaps I am over thinking it. As I keep reminding my mother, he’s not even two, and there will surely be many more opportunities in the future for confiscating mobile phones, shutting off the internet and grounding him indefinitely. For now, I’ll just stick to trying not to laugh. *They aren’t very civilised. Unless “civilised” means eating straight off the table and throwing anything you don’t want over your shoulder. I’ve heard that was the kind of civilisation that went down at a medieval banquet, so I’m claiming it. Previous Post High Heels: Aren’t We Good Enough As We Are? Next Post Going to a Blogger Conference? That is a relief. Hopefully eventually both of ours will grow out of throwing food! Thanks! Yes it is difficult. I have been trying out my “stern face,” but I’m not sure that Piglet has been taking it entirely seriously. That’s exactly what I’m thinking. At the moment he’s a bit too young for boundaries. Thanks for commenting. Yes it is difficult not to laugh! I am dreading the day that piece of food-or toy-hits someone else in the restaurant though. That will definitely not be a laughing matter! Yes I totally agree. I keep telling myself (and my mum) that he is a cricketer in the making (or rounders or baseball, or discus, or anything that involves throwing really) and he needs to hone his skills from an early age. I have no intention of picking up the Ford. She sounds completely at odds with my parenting style, to put it mildly. Yes I totally agree. I think I’ll know when it really is time to put my foot down. Thanks for commenting! Haha, great post. I admit to being a strict parent, even when my boys were young. If they threw food on the floor they were told not to, told it was wrong. Of course I let them play occasionally but they were taught the “proper” ways to act when out at a restaurant or visiting. I’m sure that it’s just a phase and your little one will cease throwing food eventually. Good luck with the not laughing. Thanks. I hope so too. I’m going by the fact that I don’t know any teenagers who still do it, so hopefully they all grow out of it eventually! Thanks! That’s pretty much my philosophy too. Haha, thanks! I’m glad to hear that he has turned out well. I’m sure Piglet will too-and hopefully he will have a good sense of humour. At the moment it’s mainly hitting Mummy that seems to make him laugh! Thank you! Yep, Piglet definitely went through that phase. Still going through it, in fact. Yes, I agree. I think I am a better parent for having teacherly skills (that’s not to say that teachers are better parents, but that I am definitely a better parent than I would have been if I didn’t have that experience), but that’s mainly because teaching has given me patience that I certainly didn’t have before. When it comes to toddlers, I’m pretty clueless as I’m much more used to teenagers. I’m sure you’re doing fine. I don’t want to be forever moaning at Piglet either, and so far he seems happy enough. I think we just have to trust our instincts, and I always feel that modelling the sort of behaviour you expect is the best way, rather than telling. When you discover the secret to stopping your boy from chucking food in the floor, please share! That is how Stella lets us know that mealtime is over. I have tried being stern and insisting she pick up her food, but she just says “no!”. I have to say, it is the “no” that makes me feel like laughing. But I haven’t (yet). She still does it every night though, so that’s not the key for her! Haha, I will-if he ever stops! Thank you for commenting. Well, at 15 weeks you have a while yet before you need to think about it! I’m pretty sure that even with my 22 month old, there isn’t a lot of point in discipline just yet. Don’t worry-I’ve never been near the Ford. Way too regimented for me! I love the ‘Dutch’ exchange student! I would have laughed. I might not laugh at half eaten banana in my face! But I’m always smiling when I want to be strict – can’t help myself! Oh well. It was very funny! I am terrible at strictness, so have basically given up, much to my mother’s annoyance! Thanks. I find it difficult because I live with my mum at the moment and we have different views on things, so we are constantly battling between us about the “right” way to parent, particularly with discipline. I tend to feel that Piglet is still very young and I try to lead by example and be gentle with him rather than shout and tell him off, whereas my mother takes a different view!